I understand what you're both saying and agree. What this doesn't explain is the other day when the system exported 7.5kW and none went to the battery and that is the cause for concern/ worry. Are you sure this was exported out to the grid ?, or was it used internally, either by house loads or diverted to hot water via the immersun ? Definitely exported. The export occurred once the two immersion heaters in the EHS had gotten up to temperature. The heat pump compressor was shut down so other than a maybe 500W background demand from the house the rest was definitely exported. There was nothing about the Growatt battery status to suggest any charging had taken place as it was indicating below 5% charge. Even setting the Immersun to export 300W as has been suggested doesn’t seem to trigger charging. I don’t know how stable the export needs to be for the Growatt to enable its charging mode? The Immersun will be all over the place during cloudy weather as it wrestles with maintaining both a minimum export of 300W and diverting power to an immersion heater and the house load. The only steady state it will see will occur when the heat store immersions cut out. A further complication occurs when the EHS is providing the central heating and keeps cooling down forcing the Immersun to go back to powering an immersion to get the EHS temperature back up. OK, you need to look at the display as it constantly flips between info and look at the "P_Grid:" info. Does it display correctly with the state if grid import / export ? Are you still getting the "No AC power flow" error ? Example, mine is showing I am exporting 25w and the status is in Standby because there is not enough export, it needs >100w of export to go into Charging mode. Now mine is showing an export of 338w, but its still in Standby mode because it needs to see >100w of export for over a minute. Its now been over a minute and its changed into Charging mode and will slowly ramp up the charging. If you are not getting correct "P_Grid:" readings, then likely that the CT Clamp is not installed correctly. Well that's me back at home again this morning and determined to get to the bottom of the Growatt 'challenge'. I've got the lid off the battery pack and connected the Growatt battery pack direct to my 48V DC charger device. I wasn't sure that the latter was working but as the voltage measured went up from 47.2 to 47.5V in short order I'm assuming it is. My intentions are to give these batteries a reasonable charge and then re-connect them to the SP2000 control unit. According to the BBC weather we should sun all day although showers are due this afternoon. I intend to switch the Immersun off if necessary so it doesn't add to the 'confusion' by continuously varying how and what it diverts. Fingers crossed I'll have some answers by the end of the day. Have just been out to get a photo of my Heath Robinson set-up............ batteries up to 47.7V. This is good news in so far as I wasn't absolutely sure the charger was working. I'm also hoping that I can re-connect the thermistors as having read they are set to -7oC then I'm assuming it is simply the fact that the battery voltage being so low has been the cause of my issues to date. The charging device doesn't seem to want to go beyond 48V....... Plan B will be jury rig a charger this evening consisting of a Variac, a FWBR and a bank of capacitors and charge the batteries up that way. Currently the Growatt is charging the batteries but it only sees a capacity of 1% so I expect things to grind to a halt once it reaches 5% as previously. nowty - I'm not seeing the P_Grid readings you show but the batteries are showing as charging currently. The figure I see is usually somewhere in the 7 - 8W range only. Assuming the Variac set-up works I should have the batteries up to 55V by tomorrow morning. Going back to nowty's question re whether the CT clamp was working or not I now have the following reply - err I'm not sure. I have two clamps and I have just tried the other one and it doesn't make any difference I still see a reading of some 6 - 7W whichever clamp is attached. I also see the same reading when I disconnect the 25mtr extension cable! It is unlikely both CT's are defective? Therefore the fault must exist in either the 25mtr Cat5 cable or the adaptor?? I need to try an alternate cable and adaptor. Almost time to try contacting Neil at Growatt. You can test it without the 25mtr cable... All you need is a kettle, knock up some cabling such that you can get the clamp around L or N... Turn the kettle on and if the clamp is the right way around is should see 2.5-3kW of faked 'generation' (reading the power backwards). Or move the growatt nearer the location of the CT clamps... first option seems easier, have used it to test immersion diverters on the bench. Can we see some pics of the clamps in use on the incoming mains, and the SP2000 end? Obviously you might need a mains extension lead to get the kettle nearer the growatt controller. In fact I did exactly this when I bought my second unit to ensure it worked before parting with the cash. Except I used a sandwich toaster. I can certainly 'jury rig' something. The Variac I was using for charging the battery pack last night has wiring that can easily accommodate a CT clamp. The cable is plugged into the sensor socket on the SP2000 so that isn't the issue. The Immersun was switched off, the sun was shining, the heat pump compressor was off so I was 100% certain I was exporting. I can provide pictures of the cable clamp locations later tomorrow although what will be learnt from this I'm not sure. I have two Immersun CT's which are working fine. I am coming to the conclusion that the SP2000 may well be defective, however I want to make sure. Checking devices is all well and good if you are anywhere near where they're being sold but I take your point. I'll revert when testing is completed. 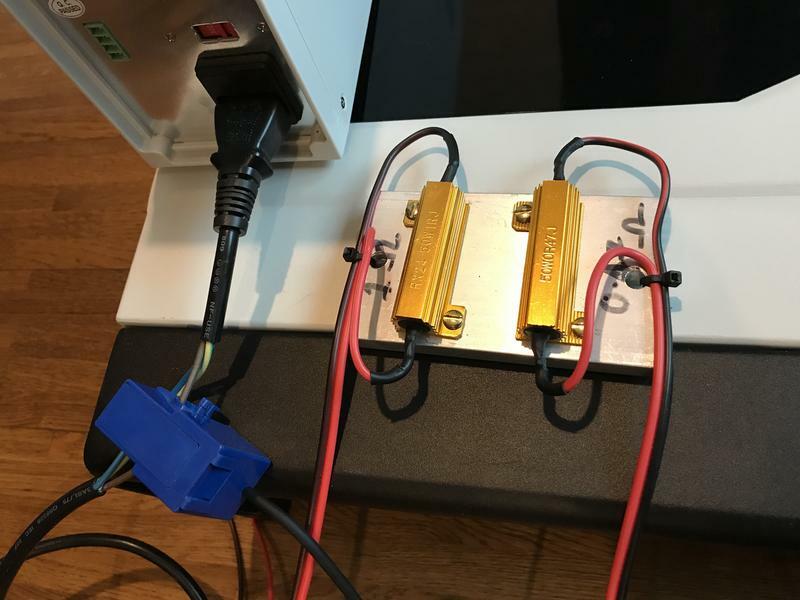 I had a quick go with one of my spare Growatt controllers, no battery or PV connected, just the controller plugged into a socket with the CT clamp plugged in. I stripped the insulation off an old computer lead and used it with a bench power supply putting 10 amps through 1.47 Ohm resistors to give approx a 150w load. Obviously I get an error because there is no battery connected, but with the CT clamp just loose, P_Grid: is almost zero. I attached the CT clamp to the live lead of my power supply giving 10 amps through a couple of resistors, approx 150w. Now P_Grid: gives +132.2w as I expected, of course it could have been negative if I had the clamp the other way around. So its easy to check. Thanks for the proof that the methodology works. I'm currently stuck in Aberdeen with a visit to the chiropractor at 1010 and then, in theory, we should be collecting the Zoe at 1200!!!!! Should manage to conduct this test later today. Its a useful test to be able to do, and should tell you something. And remember, if you want to double the reading, loop the cable around the CT Clamp twice... For triple the reading do it 3 times. Useful if you need a larger measured current. Not an issue if using a kettle as they pull near enough 3kw. of course it could have been negative if I had the clamp the other way around. How does that work with AC then? By measuring the vector multiplication of the current and voltage. You need the magnitude and phase delta for the voltage and current.